In order to put this question in context, some background on Cameroon generally, and Lower Fungom more specifically, is important to know. The country of Cameroon lies at an African Crossroads, straddling the boundary between West Africa and Central Africa, with the Sahara desert in the north, the Central African rainforest in the south, and an array of other ecologies in between. For this reason, it is known as “Africa in miniature”. 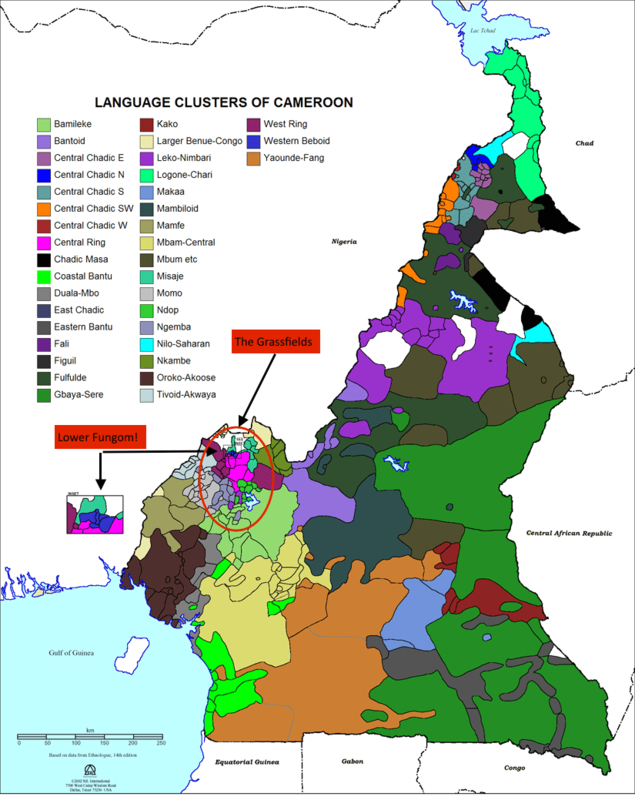 Cameroon’s diverse natural environment is paralleled by tremendous linguistic diversity. Its 23 million people speak around 300 languages, many of which are restricted to just a handful of villages, or even a single village of a few hundred people. For the most part, we know quite little about these languages. Most are not written and nearly all are spoken by economically marginalized groups. 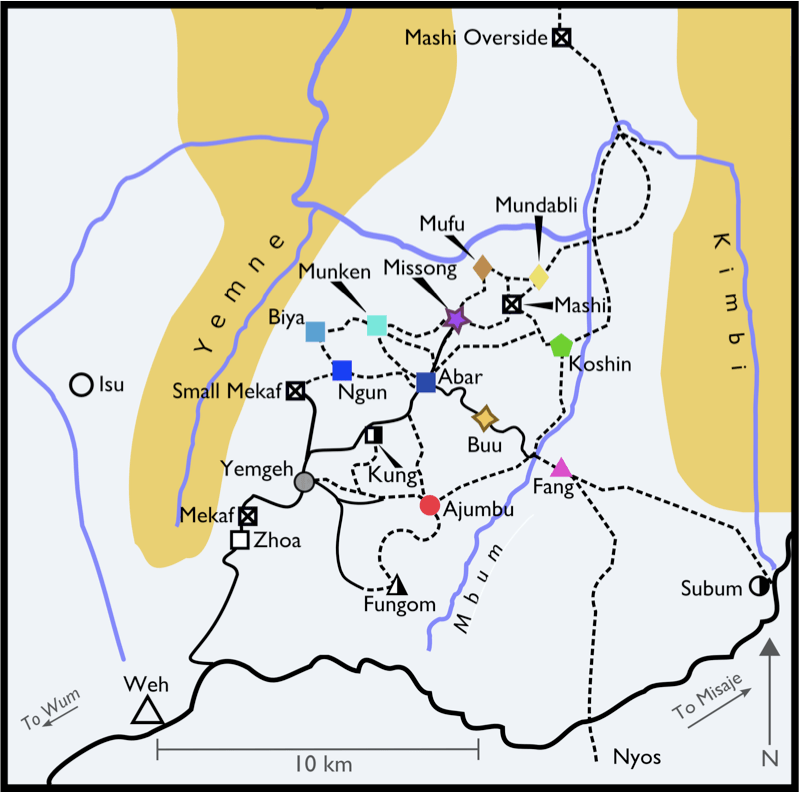 The Grassfields Region of Cameroon, found in the northern interior part of the western half of country is especially linguistically diverse. Within it, more than 100 languages are spoken in an area around the size of Belgium. And, within the Grassfields, at the area’s northern edge, this diversity reaches its apogee in Lower Fungom, the region that has become the focus of my research, as well as the Pig for Pikin project. Lower Fungom is essentially unknown internationally and is even hardly known within Cameroon itself. It is merely 10km from north to south and 10km from east to west. There, one finds nine different languages associated with its thirteen villages and 12,000 or so people. The people of Lower Fungom are highly multilingual, speaking on average five or six languages. They acquire most of these without any formal instruction. As someone who has spent most of his life in the United States, Lower Fungom felt to me like the “anti-America” linguistically. Where Americans emphasize monolingualism, with English as the single language of identity (despite its citizens’ multilingual origins), the people of Lower Fungom embrace an array of “hyperlocal” languages, five of which restricted to just one village. They use multilingualism to overcome any potential negative effects of linguistic fragmentation. Linguistic diversity does not need to be a barrier to communication in societies where everyone knows many languages. Lower Fungom is so linguistically diverse because its people find value in using languages to express distinctive local identities. But, by choosing multilingualism, they are not “trapped” in just one community but can express their belonging to many.